Let’s start off with why people put plants in the ground at all. We are biological creatures. We have risen up in the nursery of the earthly world and even the most urban person seems to have an attraction to green things. 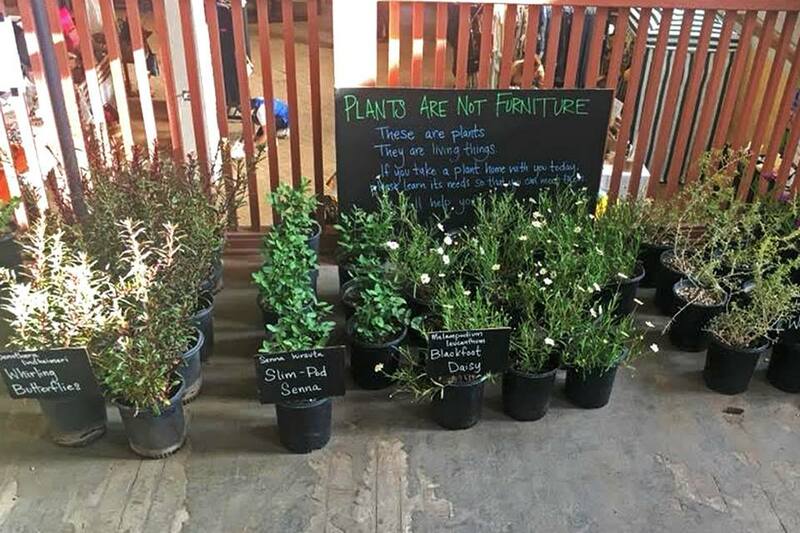 A flaw in our modern way of looking at things has us treating plants like furniture. If you have been to one of our sales, you probably have seen our sign. It’s a fair question. We aren’t telling you that you have to plant things that don’t please you. We just want you to see plants as living things, and also to realize that it might be for more than just visual pleasure that you make the effort to plant something in the ground. Oh, and you aren’t a bad person for having a rose plant or some petunias. Even we have some non-native plants in our yard. But they do take up less and less space in our landscape as time goes on. Plants are part of an ecology. We are also part of that ecology. A majority of people naturally respond to visiting pristine wild areas in a positive way and virtually nobody enjoys urban decay in the same manner. This is because we really don’t want to be alone in the world as a species. We literally can’t. Our food, oxygen, medicines, everything comes from other species. We cannot even digest food without all the tons of organisms that are not us, living in our guts. Human cells make up only 43% of the body's total cell count. The rest are microscopic colonists—other organisms. We plant things because we need the company, whether this is something we directly know or not. So why plant native plants over all else? On a personal note: when I first moved here, I came here to study botany. I have always been obsessed with plants. I collected lots of plants, native and not. I was obsessed with their various forms. The weirder the better. After several decades of growing plants, I have started to appreciate more than just the plants I am growing. I’ve realized that this whole time I have been building small ecosystems in whatever place I’ve lived in. Along with the plants I’ve installed, I’ve improved the soil by building up its microbiological diversity, and I’ve been feeding insects and birds and countless other organisms. As I’ve become more and more obsessed with attracting bees and butterflies and birds, I have realized that the more interesting plants are the native ones because they already have a relationship with all the native organisms. Native plants have evolved with these birds and insects in my back yard. When you plant native plants you have more likely planted a larval food plant for a butterfly. If you planted a native mesquite, your likelihood of having a Lucy’s warbler hang out in your yard in the spring is so much higher (because they prefer our native mesquites). There is more to this than just that insects and birds haven’t evolved with some of these exotic plants. The plants themselves also bring foreign elements that native plants can’t cope with. Fountain and buffel grass bring fire to the low desert. This is something plants like saguaros, palo verdes, brittle bush, and most other species in these same ecotypes, have not evolved with—they generally don’t recover from fire. Are there other benefits to planting native? If you spend a lot of time in Arizona, you may take for granted how much regional identity we have. Arizona has its own unique culture that has been defined by our history, our proximity to the border, and of course, our landscape. Being in the desert may be difficult at times, but it has its advantages. Our climate is formidable, and as a consequence we have relatively less exotic weeds than the rest of the country. Many places in this country don’t even have many remnants of the original flora left—having been overtaken by introduced species. A drive through Los Angeles and you may not have any idea what is native and what is not. Planting native plants is still a new or even foreign concept in most of the United States. But in Arizona we have saguaros. We are lucky enough to have such a unique and rich flora, that our ecology still greatly reflects what evolved here. Arizona has a unique and distinct identity that is to be celebrated—and is. The world notices us. You can see a picture of Arizona and there isn’t any doubt about where you are. You cannot say the same for pretty much most other places in this country, and much of the world. That isn’t to say that we haven’t done our damage. Fountain grass (Pennisetum setaceum) and buffel grass (Pennisetum cilare) are taking over the foothills. African sumac (Rhus lancea) is creeping into the Tucson Mountains. The African native Lehman’s lovegrass (Eragrostis lehmanniana) is now the dominant grass in Southern Arizona grasslands; the ecology is forever altered and there is no return to what was before. Some of those changes we will need to live with, others can, and need to be reversed. But in general, southern Arizona still looks like southern Arizona. And while we seek to learn how to draw the resources we need as a species from the planet in a less intrusive way, we can do better to make more safe spaces for the wild in our own backyards. We want you to see your own space in the world as a connection to all that sustains you—the natural world that you are a part of. Invite in the insects and birds. Don’t make a landscape, make a habitat. Don’t force the plants to perform for you, work to provide them with what they need and don’t be bothered if they have a season when they are more dormant. If you need a guide to how to make this happen more, go hiking! Spend more time in the natural areas, and then mimic them in your own yard.